Can you see what I did wrong here? A problem with the drawer back. I should have been more careful cutting the dovetails. That drawer back doesn’t look right…. The two sides are supposed to be taller than the back. The drawer bottom needs to be able to slide under the back after the drawer is assembled. So where did I go wrong? I wasn’t being careful when I marked out the dovetails. I should spend a little more time drawing out the layout before starting to cut. So what do I do now? I think I will just shorten one of the side pieces and cut new tails to match the pins on the back side. 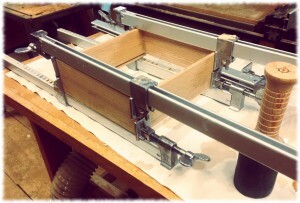 I’ll then have to cut the front end of the other drawer side to make them the same length. The drawer will just be a little shorter than the drawer in the other table. It should be a little bit of a challenge. 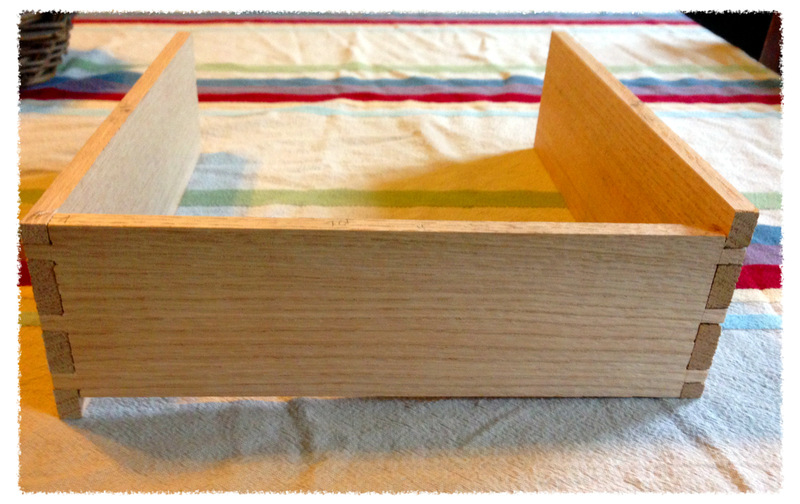 I have been making the dovetails “tail first” and haven’t made any “pin first”. But I need to learn sometime. Oh well, that is what I get for rushing. The question is: Do I go back into the shop tonight and fix this, or decide that I’m not being careful enough and call it a night…. 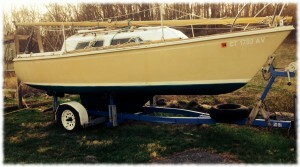 The boat with the first coat of the new (green) bottom paint. Well, Sunday wasn’t quite the day I had hoped for. I had hoped to get the first coat of bottom paint on the boat and get some workshop time, finish up the drawer for the second table and then head out for a sushi dinner. Of course, the invisible fence broke on Saturday night. 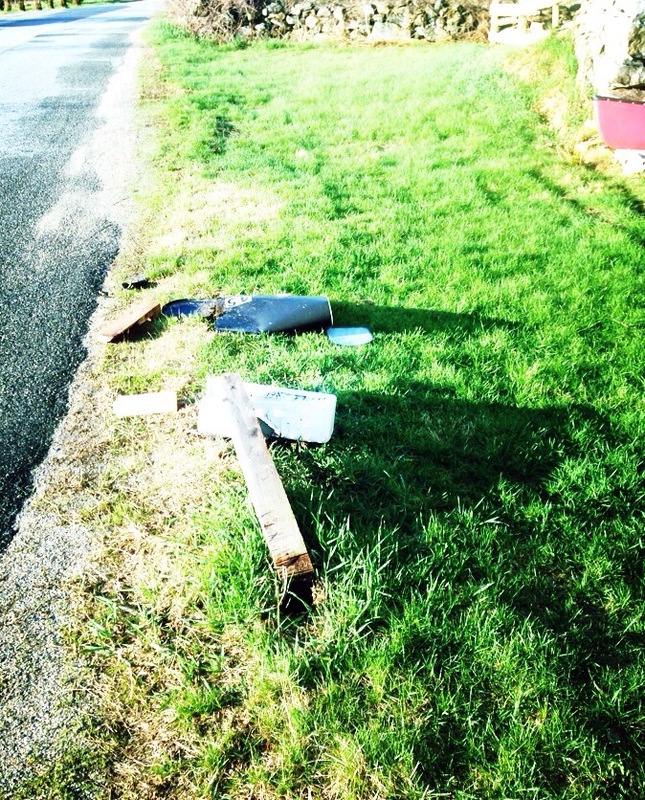 And then late Saturday night someone decided to flatten the mailbox. They flattened six other mailboxes on our street that night so I don’t feel too special. Not that replacing the mailbox is a difficult job. And neither is fixing the invisible fence. Normally. Sunday morning, after the boys went to their mother’s house, I figured I would go out and fix the break in the fence and then go to Home Depot with Susanna to pick out a new mailbox. There is a junction between two sections of fence wire right next to the driveway, and normally it gets broken when people are turning around in the driveway and go off the pavement a little bit. Of course it wasn’t broken there. I walked the boundary and couldn’t find an obvious break. So I had to troubleshoot. It didn’t make sense. The break was in a section of the front yard where it had been buried for a long time. Anyway, in the meantime, with no invisible fence, the dogs decided to break from the yard. 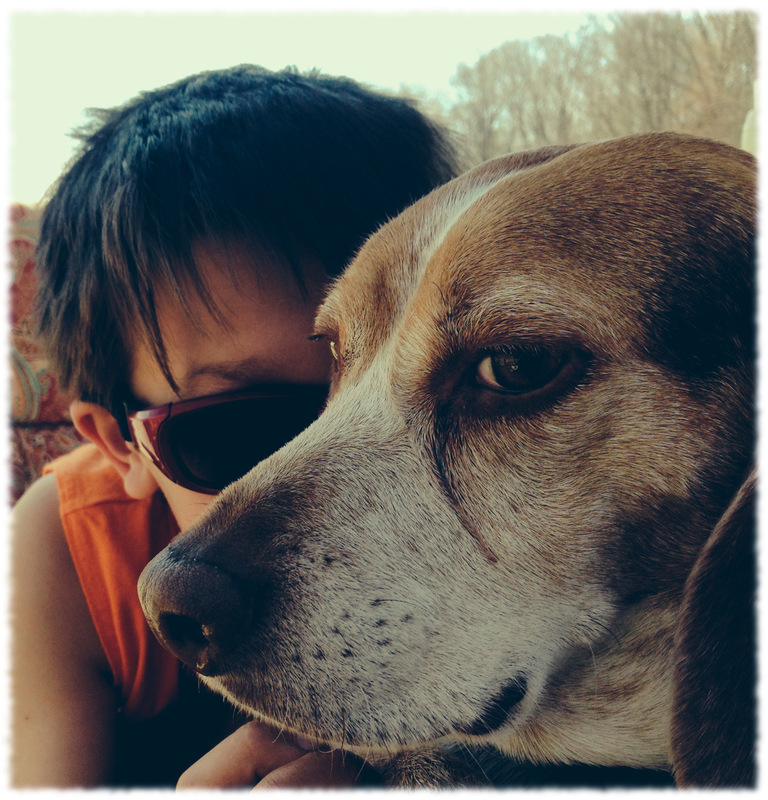 We don’t even get a 15 minute “stay in the yard” break with the beagle. As soon as the fence is down, he is gone. And I still had to dig up the front yard and replace the wire and buy and put up a new mailbox and hopefully paint the boat and be done in time to clean up and go out for an early dinner that night. The dogs running away was the last straw. I was not in a good mood. And me being in a bad mood didn’t help Susanna be in a good mood. Time to take a break and be pissed that nothing was going right that morning. Then get over it. Then go to Home Depot and get a new mailbox. I did get the mailbox installed (and it survived its first night along the road). I also got the wire replaced with the yard only looking partly like crap where I dug the trench. I didn’t get done in time to make an early dinner date. I also didn’t get to the boat. I was able to get to the boat tonight after work. I got most of the bottom painted with the first coat. We changed the color of the bottom paint from blue to green. Just to be different. And because I couldn’t find pink as Susanna had requested. And yellow seemed like the wrong color for this year. Maybe tomorrow I’ll get into the workshop and work on the drawer and finally catch up on my Sunday projects. A new project for today . Taking a break from our afternoon bike ride. Will cooking grilled cheese for the family. It was 70-degrees here today. And Sunny. We had a busy day. I would write all about it, but I’m too tired to spend enough effort to make a long post make sense. Or at least get the post to what passes as making sense (to me). So I’ll keep this short (which I’m sure Susanna is thankful for) plus post some pictures from today. The boys had soccer practice this morning. I got to sit and watch, so I’m not as tired as they are. They spent most of the afternoon playing basketball. Or make-believe Pokemon with the basketball. I don’t think I’m making sense. But I don’t think they did either, so I’m not too worried. Anyway, it was some sort of game somewhat resembling basketball, but different. Will pushing Michael on our walk down the street. He needed a snack and a break from his brother. Will got in trouble last night for complaining too much about helping clean up the kitchen. So he got to make and clean up all of lunch. He was upset at first because all he knew how to make was peanut-butter and jelly sandwiches. And he is sick of them because that is what he makes every day for lunch at school. 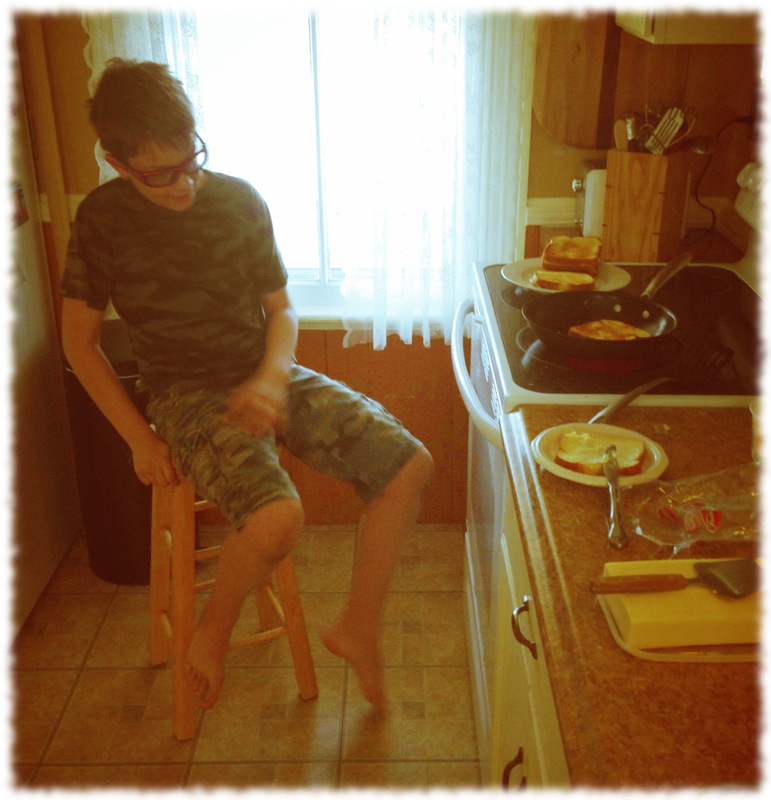 So I showed him how to make grilled cheese sandwiches. He made all but the first sandwich. With almost no help (though with supervision). Now he can make two things in the kitchen. He only burned himself once (a little bit). On the same hand that he had cut at breakfast trying to slice a loaf of bread (again a small injury). Yes, learning to cook can be painful. Just wait until he learns home repair. Susanna and I cleaned the patio after lunch, cleaning off two years worth of leaves and fighting back the encroaching yard. It was much-needed. I had a chance to start sanding the bottom of the boat in preparation for painting. We are switching the bottom from blue to green. Tonight we get to babysit Michael. It was a surprise (to me). Susanna had agreed a month ago, but we all had forgotten about it. Luckily we had no major pans (other than enjoy the nice weather). 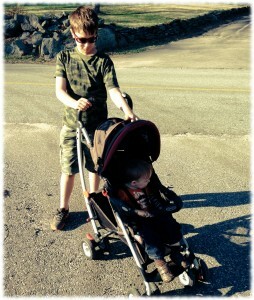 I actually got Will to help me take Michael for a walk down the road. Will even went to the neighbor’s house to borrow a stroller. We are finishing the night with two very tired adults, two exhausted and sleeping Curtis boys, and one not quite ready to sleep toddler. So much for keeping this short. 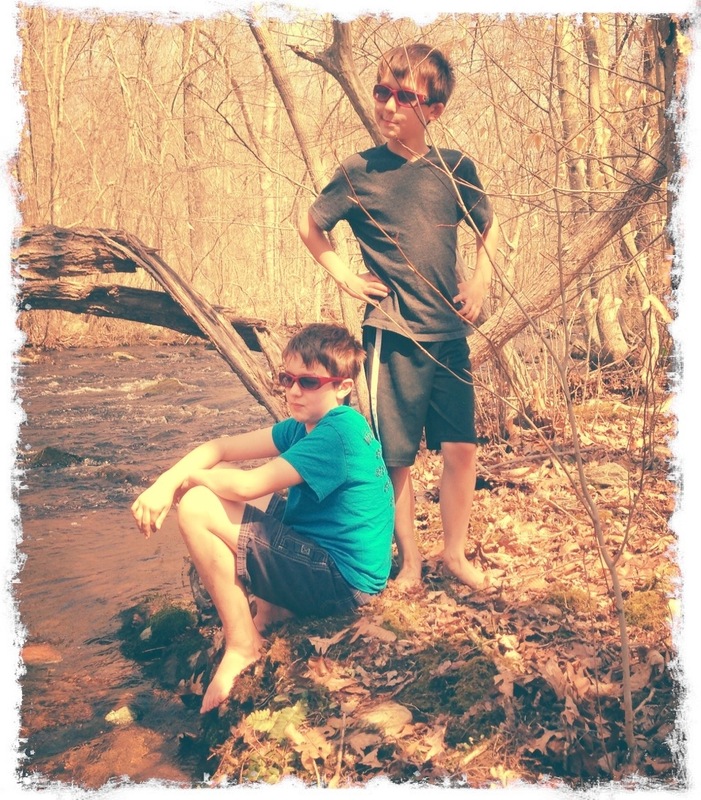 Ben and Tucker enjoying a warm spring day. 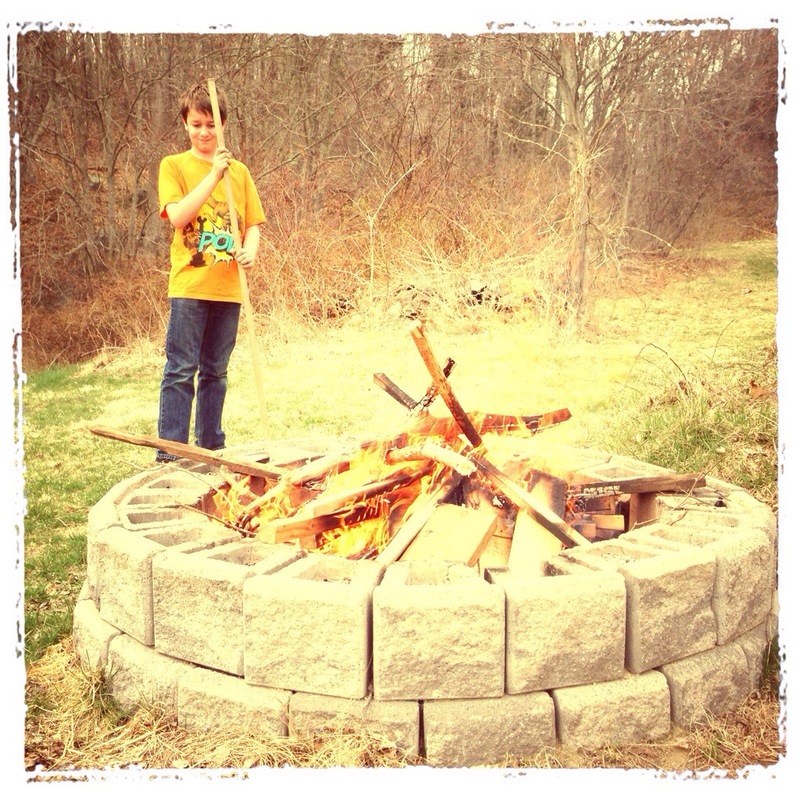 Will by the fire pit. 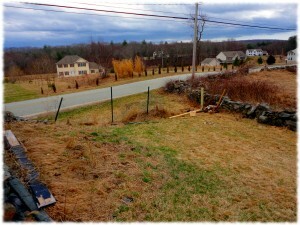 The new fence, ready to let the weather gray the wood. 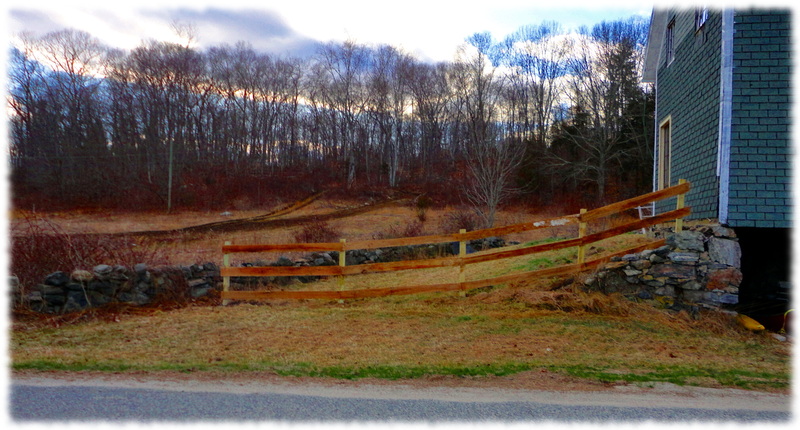 Susanna and I have been wanting to replace the fence next to the workshop for a while. It wasn’t a big project, just everything else got in the way. Until today. And I know that I’m not the best at guessing how long it will take me to complete a project. I’m just easily distracted. 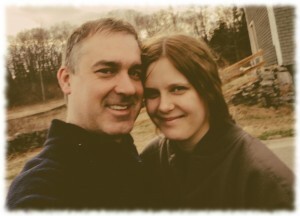 Susanna just mentally adjusts the expected completion of a project whenever I give her a date that I’ll be finished. But sometimes they really don’t take that long to finish. I had guessed that the fence was an afternoon project; and we started bulding in the afternoon and finished before dinner. That included cleaning up (but not restacking the lumber beneath the barn). 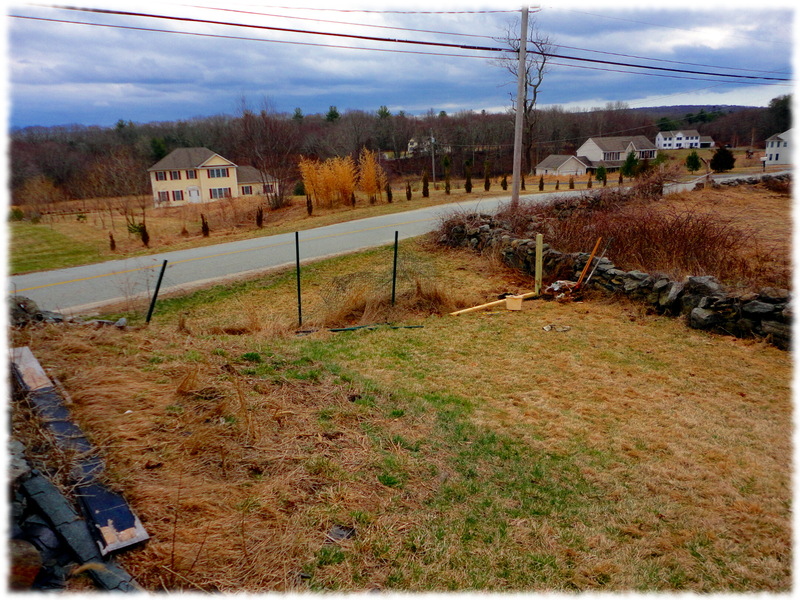 The old fence was a green wire fence (we needed a fence to keep the dogs from running out of the yard on that side of the barn. We replaced it with a three board fence. The invisible fence follows the wooden fence, so it will keep the dogs in the yard (Tucker escapes from the back of the yard anyway). A tired and happy us after finishing the fence.